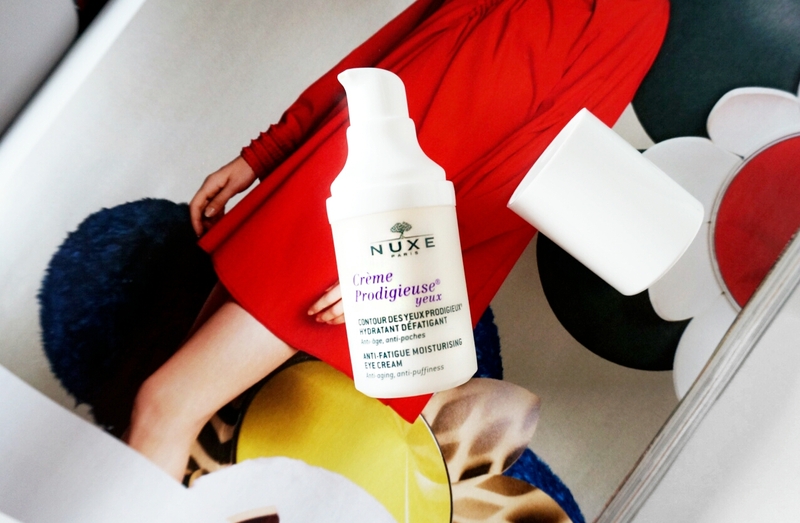 NUXE Contour des Yeux Prodigieux is a moisturising eye cream to slay dark circles, tired eyes, fine line and wrinkles. The eye cream contains powerful anti-ageing and de-congesting ingredients; Hyaluronic Acid, Botanical Caffeine, Vitamin A and E and is suitable for all ages. Hyaluronic Acid helps hydrate the eye area and reduce signs of ageing; Botanical Caffeine to combat puffiness, reduce the appearance of dark circles and Vitamin A & E to smooth fine lines and wrinkles to firm and tighten skin. I have fine lines around my eyes and suffer from dark circles, I have been searching for eye creams that helps combat with this problem. The eye cream is very moisturising and helps hydrates my under eye area. It is also very easy to get the right amount of product (you only need a little) with the pump applicator. The smell of this reminds me of a strong jasmine tea, it has cooling effect which lingers for a couple of minutes. Unfortunately I stopped using this after a week, as I found it too potent for my undereye area and started getting little white bumps around my eyes (milia) which are blocked pores. With all the ingredients inside I found it to be too strong, I can't say anything for reducing dark circles or fine lines, but it is definitely moisturising. I haven't had this effect before but it started when I used this, so I'm going to have to give this a miss. Have you had this effect before? I am currently in Hong Kong heading to Korea for a couple of days. Catch up with me on Instagram and see my other Hong Kong related post (here). I hope this inspires you.